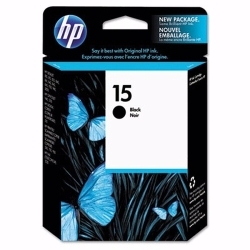 HP Black #15 IJ Print Cartridge (C6615DN) : Disk-O-Tape, Inc.
Get up to twice as many pages vs. with refills. Ensure that your printing is right the first time, every time. HP Inkjet printers and Inkjet print cartridge compatibility. The HP 15 cartridge is compatible with the following HP printers. Actual print cartridge life will vary depending on the type of printing done and the printer used. The table below provides a guideline to determining how many pages the print cartridge will print. To calculate the approximate cost per page, divide the number of pages into the cartridge price.